You have 2730 characters. Don’t forget to add important and relevant keywords in your description to improve your iTunes app page and optimize your SEO. Your app's last version was released on February 03, 2015. It is important to regularly update your app. Best practices recommend to update your app every 4 to 6 weeks. This means fixing reported bugs, improving existing features, launching new features etc. Keep an eye on users' feedback. The next great features may already be asked by many users. Peppa Pig’s top selling Number 1 Kids Game App on has been updated AGAIN. 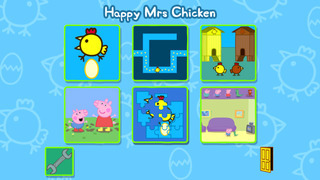 Peppa Pig Happy Mrs Chicken includes 5 interactive games – plus special bonus reward sticker book. Featuring Peppa Pig and her family plus all the familiar music and sound effects this app is sure to delight all Peppa fans. • JIGSAW PUZZLES - four brand new jigsaws can be attempted in different sizes - six, nine and twelve pieces. 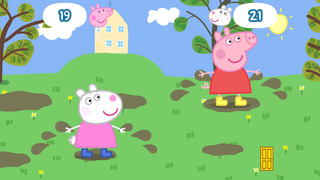 • MUDDY PUDDLES can be played as either Peppa or George against one of their friends. Be the first to jump in as many muddy puddles as possible. • HAPPY MRS CHICKEN is based on the Nintendo DS mini-game and is directly inspired by a game that Peppa plays in the popular children’s TV series. 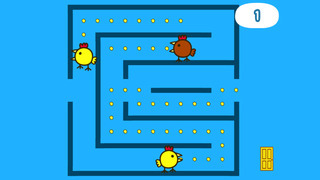 The player can make Happy Mrs Chicken lay eggs and these eggs then hatch into chicks and scurry to either side of the screen. • CHICKEN COOP involves sending different coloured chicks to their correctly coloured homes and includes a mode against the clock. • SEED AND MAZE is a maze-style game that involves the player dropping a seed trail to guide the chicks home through a variety of 6 mazes. • STICKER BOOK - Collect virtual stickers along the way and decorate a ‘sticker book’ with many different items and characters. English, French, German, Italian, Spanish, Dutch, Danish, Swedish, Norwegian and Finnish. This is a P2 Kid Safe App. P2 Kid Safe apps DO NOT contain in-app purchasing or data gathering systems of any kind, meaning your children can safely play without fear of unwittingly purchasing app content or credits, or disclosing data about their playing habits, location or the device they are using. We are committed to bringing all our customers the highest quality apps and aftercare service and are always looking for ways to improve our games so please get in touch if you have any suggestions or feedback. In the unlikely event that you experience a problem, please email our support team who are waiting to help you. Email us on support@p2games.co.uk you will usually receive a reply within 24 hours. If your child likes the game, please leave a review or why not Gift the App to a special friend. Pre-school phenomena Peppa Pig is currently the UK’s NUMBER ONE pre-school property. The popular TV show is aired multiple times throughout the day on Five’s Milkshake and Nick Jr.